It was the first weekend of summer and the weather was beautiful. On days like this, Mom and I like to hit up the local clam shacks for some delicious fried seafood, and a clam shack is what we expected when we received a gift certificate to Mattapoisett Chowder House and Tavern from MenuJoy.com. However, what we discovered was a beautiful restaurant complete with a full service fish market inside and pizza place at the same address! We pulled into the spacious parking lot at 3:35 p.m.
Once inside the nautically-themed restaurant, we were greeted by a hostess who took us to our table and left us with large menus to peruse. Our waitress – Alex – soon appeared to take our drink order. We chose two Diet Pepsis which arrived with lemons. Mom already knew what she was going to get before we even walked in the door, but I was still on the fence. 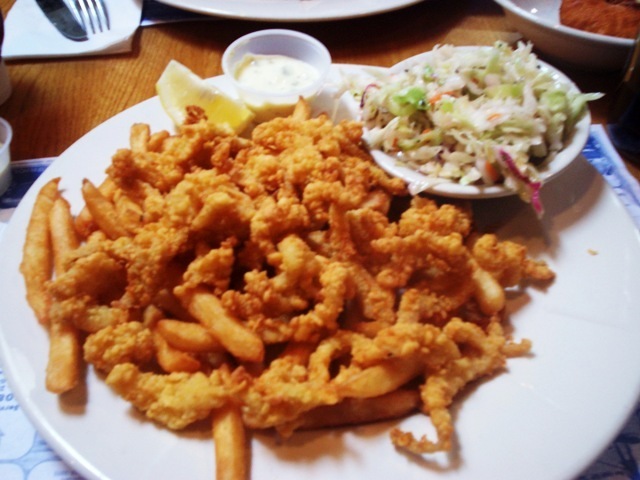 Finally, I decided on the clam strip plate which came with fries and cole slaw, while Mom ordered the medium fish and chips English style. Her meal also came with cole slaw. We also ordered a half dozen clam cakes for an appetizer. 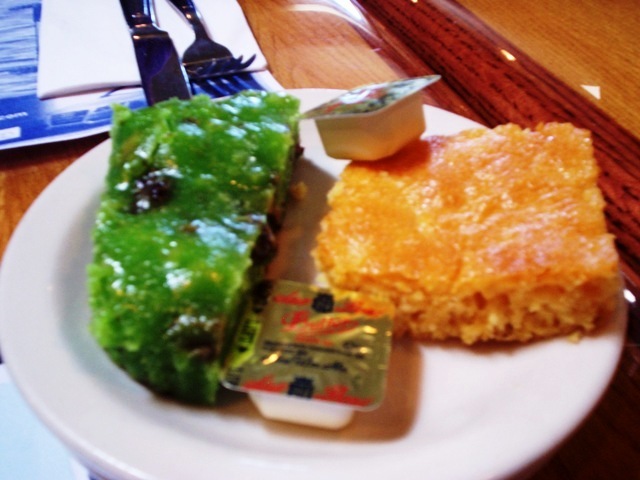 To start, Alex brought over a plate of corn and pistachio breads which were moist and warm enough that the butter we spread on top melted on its own. The flavor on both breads was strong and tasty. This was a great start to a fabulous lunch! The clam cakes arrived quickly and had a dry coating which Mom and I would much rather have over a greasy ball of batter. The insides were soft and had a perfect mixture of clams and nicely cooked dough. I doused mine with malt vinegar while Mom just ate them plain. They came with a side of tartar sauce which was tangy, but I prefer malt vinegar any day. The dining room had a good mixture of both tables and booths. 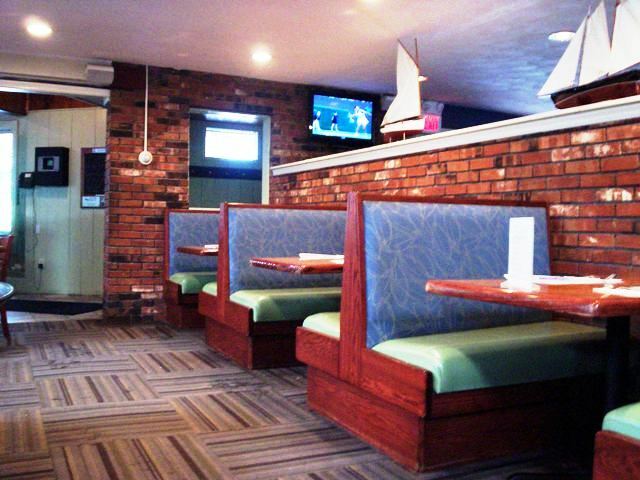 A fireplace was located toward the back of the restaurant where we had been sitting, and handmade sailboats sat atop the wall that divided the row of dining room booths and the bar area. 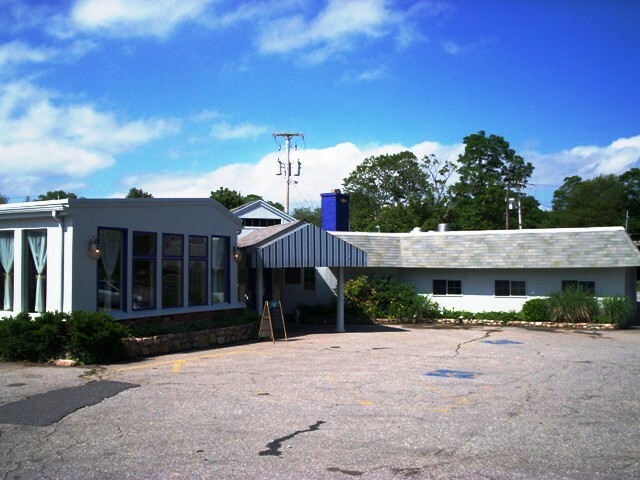 Everything was blue and white, and the vibe was very much that of a typical New England seafood restaurant. Mom and I felt right at home as we waited for our meals, and we hadn’t been waiting long before they appeared. Both plates of food were large and looked amazing. Before I get into the meals, let me talk about the cole slaw. It was FANTASTIC. I’m not a fan of mayonnaise, but cole slaw is one of those dishes that you can’t make without it (think chicken and tuna salads). The cole slaw at Mattapoisett Chowder House, however, uses a red wine vinaigrette base along with a pepper seasoning. It was so delicious that it needed a mention all on its own. My clam strip plate had been an excellent choice. The strips were tender and meaty while the batter was dry, which is how I like it. The fries were also good and may have been twice baked as they had a crispy golden shell with a nice crunch to it. Mom’s plate of fish and chips was one of those attractive meals that someone else gets that makes you wish you would have gotten it yourself. 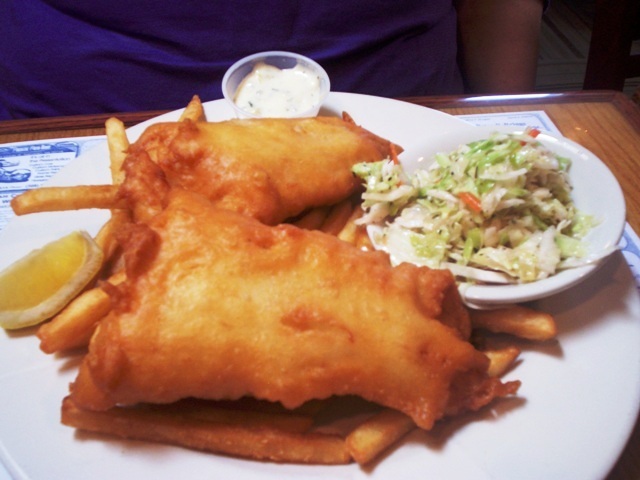 There were two large pieces of English-style fish, which means that the crust is a little crispier than normal. 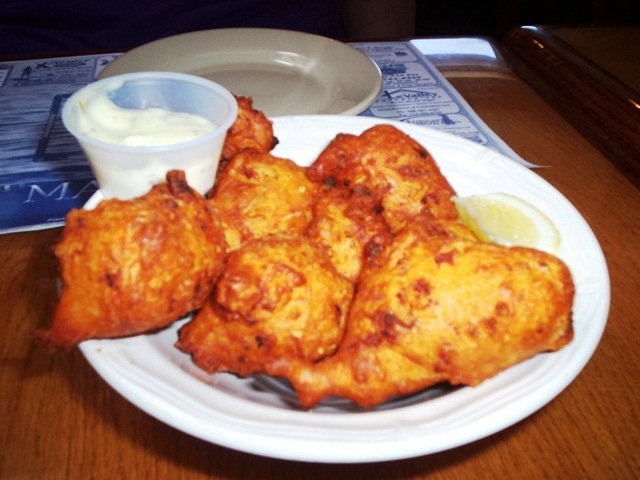 The batter was indeed thin and crisp like a freshly baked cookie, while the fish inside was white, buttery and flaky. Mom also enjoyed her fries, but moved her pieces of fish elsewhere on the plate so that the fries trapped underneath would not get soggy from the heat. She gave her cole slaw to me, and I was completely fine with that. Since we had our $10 MenuJoy gift card, we were under $20 before tip. We left $35 for Alex which included a 20% tip – which had already been calculated for us at the bottom of the bill. It gave us different options for tipping, which we love! I don’t have to bust out the calculator or – Heaven forbid – attempt to do math after I’ve entered a food coma. Before leaving the restaurant, Mom and I checked out the ladies’ room. It was cute and clean. 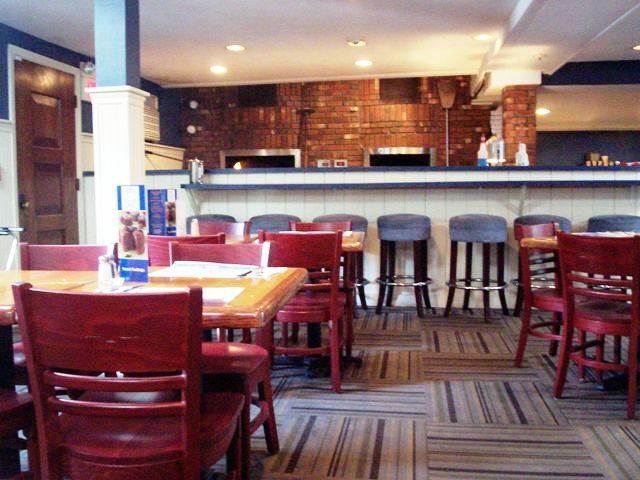 Mattapoisett Chowder House also has some fishless options like wood fired pizza, steak and chicken, but the main attraction by far is the seafood. They have everything from lobster and salmon to stuffed quahogs and a raw bar. Click the link above to check out their full menu. I’m currently looking at it now to decide what I want on my next visit. They have a large function room where you can plan your next bash! Mom and I can’t wait to go back to Mattapoisett Chowder House and Tavern. Going to a clam shack is lots of fun, but when the long lines and annoying crowds of sweaty children and miserable parents get to be too much, cool off by stopping inside MCH for a lovely sit-down seafood meal. 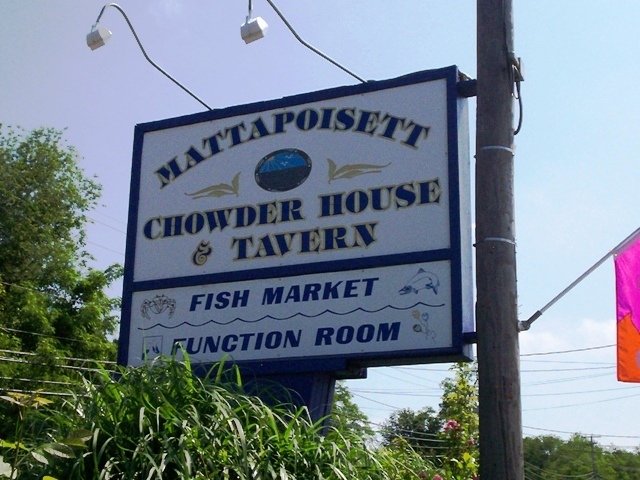 Mattapoisett Chowder House and Tavern is open from 11:30 a.m. to 9 p.m. Monday through Thursday, 11 a.m. to 10 p.m. Friday and Saturday, and 12-9 p.m. on Sunday. 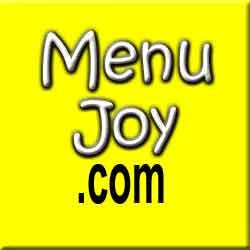 Visit our friends at MenuJoy.com for local restaurant menus.